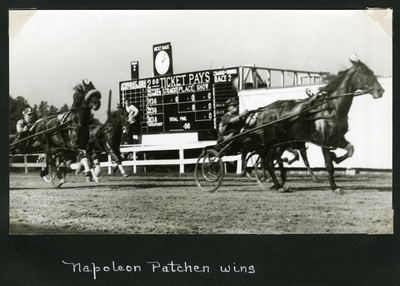 Black and white action photo of bay gelding, Napoleon Patchen, Berry up, winning the Classified Pace on Friday, October 6, 1939 at the West Oxford Agricultural Society Race, Fryeburg, Maine. Finishing in second place is chestnut mare, Volodale on the left, wearing a shadow roll. Brown gelding Directum J., Jr. finished the race in third place.